While I obviously appreciate using the finest materials in my flies, fishing the Skeena and Bulkley has opened my eyes to what is most important when I comes to catching steelhead...That is movement in slow greasy seams along the bank in dark water and the slow water next to a faster seam in clearer water. With a lot of trial and error it is absolutely hard to beat marabou! It holds its profile in faster water with a good prop, then when it hits slow water, it puffs out and breaths like a living moving critter. 3. Utilize a dark head in the front and a bright bead at the hook eye for a visual "Bite" point to try and avoid the on and off problem of fish on the hang down and in slow water. 4. Offer it in the only two color patterns that I use myself and will be using until something comes along that proves to be better, then I will adapt! 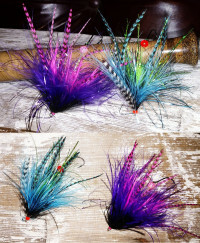 Purple/Pink- This is my go to color and I will fish it almost exclusively all winter into the late spring. All my steelhead last winter and spring came on this fly except a couple on the Methow. 3"
Methow - Maybe the best all-around color pattern we have ever found. It will work in murky water but really shines in clear water, sunny bright days. 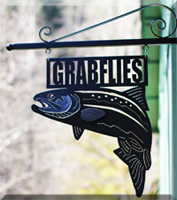 Killer fly on clear rivers like the Bogi, Quinault, Washougal, Deschutes and the like. 3"